2 slices deli sliced corned beef** or ham or roast beef, etc. Preheat a large skillet or griddle on medium heat. Lightly butter one side of bread slices. Spread non-buttered sides with Thousand Island dressing. 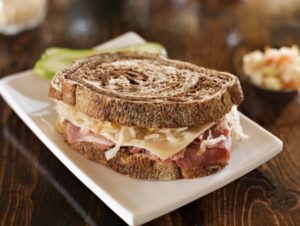 On one bread slices, layer 1 slice Swiss cheese, 2 slices corned beef, 1/4 cup sauerkraut and second slice of Swiss cheese. Top with remaining bread slices, buttered sides out. Grill sandwiches until both sides are golden brown, then finish it off in the microwave on high for 45 seconds, turning over halfway through. Serve hot. **Please note: Schmidt’s 647 (above) is the preferred low carb bread, and corned beef is the preferred deli meat for a Reuben. The sandwiches need not be grilled; a small frying pan will do very well.